It’s Seattle, so bring an umbrella and baby carrier. Keep in mind that rain is very common in Seattle. Middle of October worked out perfectly for us. Try to bring snacks and water to avoid any unnecessary food purchases. This full-day itinerary hits some great Seattle attractions for kids and adults. This was our first day in Seattle and our goal was to feel out the city by eating its food, walking its streets and seeing it all from above. Start off the day at Sweet Iron Waffle Bar, which has great options for sweet and savory waffles. Then, begin the walking tour and head out to Pier 56. Catch some great views along Elliott Bay. Next, take a leisurely stroll up to the Space Needle and get a bird's-eye view of Seattle. 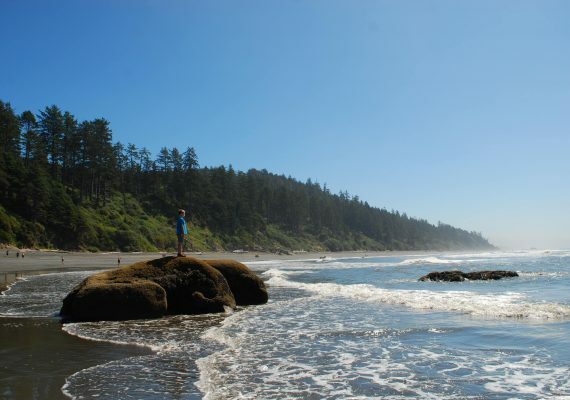 It may seem touristy but not only are the views great, it has a playground for the kids. 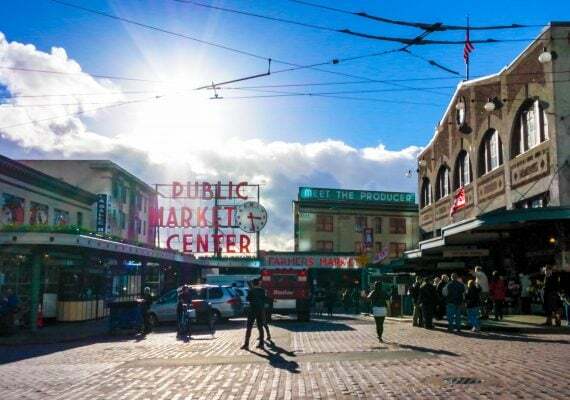 Lastly, a trip to Seattle with kids, or for anyone, wouldn't be complete without a visit to Pike Place Market. The food choices are endless and enticing (we grabbed something at Pike's Pit Bar-B-Que). 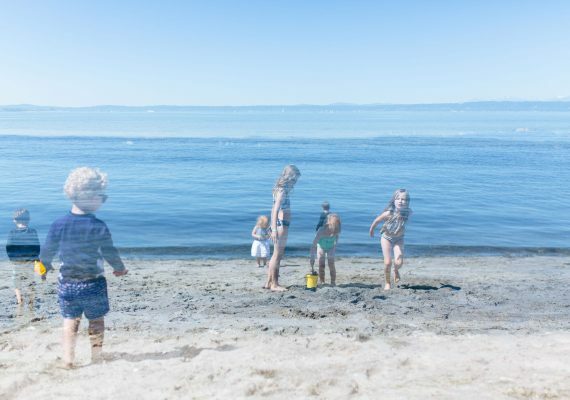 All in all, this walking tour offers a great balance of things to do in Seattle with kids. Sweet Iron Waffle Bar offers a variety of brioche-style dough sweet and savory waffles, fresh cold-pressed juices and coffee. It’s relatively small, about 5 or 6 tables, so try to get there early. We absolutely loved it. DIRECTIONS Sweet Iron is located on 3rd Avenue between University and Seneca Streets. It’s a 5-minute walk from the Sheraton on 6th Avenue and a 5-minute walk from the Great Wheel near Pier 56. Pier 56 has incredible views of Elliott Bay, boats, mountains, the Great Wheel and downtown Seattle. It’s also a perfect place for your nugget to run around and for you to take some pics. DIRECTIONS From Sweet Iron Waffle Bar, make a right on Seneca Street and go all the way down to Alaskan Way. Make a right on Alaskan Way and the pier will be on the left on the water. 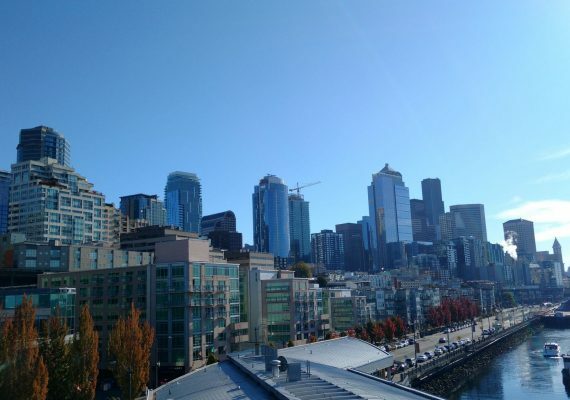 The Space Needle might seem like a tourist trap, but it really is the best way to see all of Seattle and its natural beauty of water and mountains. We spent a good half an hour taking photos of the incredible 360-degree panorama. Our nugget wasn’t as interested in the views as my husband and I were, but she did enjoy the elevator ride up 520 feet (160 m) and back down, as well as the variety of tasty treats offered at the deck. Once we were back on land, we headed right to the very cool playground that sits underneath the needle. DIRECTIONS From Pier 56, we took a half an hour walk to the Space Needle following Alaskan Way and side streets. On the way, there are countless opportunities to take photographs of the bay and the skyline. Seattle is full of modern architectural gems. TIP There is a bit of a line to get to the Space Needle, so be ready to entertain your kid for about 10-15 minutes. Although this was a weekday, Pike Place Market was pretty crowded. This place is heaven for people who like food. We had delicious turkey legs at Pike Pit Bar-B-Que. DIRECTIONS From the Space Needle, we walked about 30 minutes, taking side streets to the famous Pike Place Market. TIP Leave the stroller at the hotel and bring the baby carrier instead. WE LOVEDThis hotel was pretty close to luxury to us. The room was very spacious and had an incredible view. Everything was very clean and super comfortable. Location was ideal for walking to Elliott Bay and the Space Needle. TIPBe careful with the prices at the café in the lobby.